Collar and cuffs trimmed to match any pair of trousers. 100% sanforised, shrunk, cotton drill, double breasted, cuffed sleeve and poppet buttons..
We continue to focus in producing excellent clothing with the venture into the Hospitality Industry Uniforms from 1989 onwards. 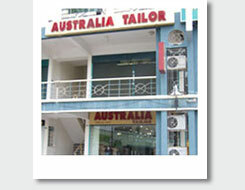 Australia Tailor has since specialized into Chefs and the F&B Clothing from classic chefs’ trousers, aprons and jackets to our range of restaurant, bar and kitchen aprons. Easy to launder and with a wide choice of styles and colours, you will presented in a crisp, clean image that you are striving for. All of our efforts on accomplishing one objective, that is, to assure you complete satisfaction and meet, or exceed, your expectations for high quality, stylish and comfortable uniforms in the work place. We love hearing from you, so please do not hesitate to contact us with queries, or comments on how we may better assist you. 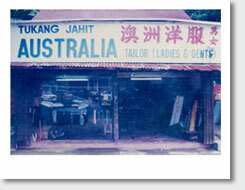 We thank you for your patronage in the past; and if you are new to Australia Tailor, please accept our welcome and know that we look forward to serving you.